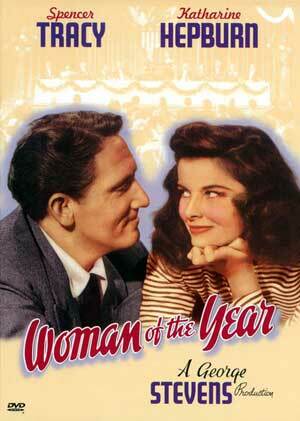 Woman of the Year, the first collaboration for Spencer Tracy and Katharine Hepburn, tells the story of a political columnist and a sports reporter who meet after trading barbs, fall in love, and then find marriage isn’t quite the bed of roses they thought it would be. Written by Ring Lardner Jr. and Michael Kanin, the film contains some amusing dialog and a couple of laugh-out-loud sequences. Overall, though, the film struck me as rather unremarkable. From the beginning, I was never really quite certain what Sam saw in Tess, nor what she saw in him other than he had the moxie to actually go after her. There was an obvious physical attraction and even an undeniable chemistry between the two leads, but I never understood the undercurrent that pulled these two together. For the modern viewer, the second act seems to drag on longer than necessary. There’s a good twenty to thirty minutes in the middle where the plot gets too serious for its own good. (It was at this point, when we had to pause the movie for a moment, that my less-patient-with-movies-than-I-am mother remarked, “Is it just me, or is this movie really boring?”) Luckily, they saved the best for last as Tess attempts to make breakfast for Sam in a last-ditch effort to save their marriage. That scene alone bumped the film from 2½ stars to 3 on my scale (of 5).